see fit. Some checks are done automatic with most schematic and pcb layout software, but serve as reminders. 1. Use a suitable universal file name for schematics, and backup the file. Consider how useful “new_powersupply.scm” will look in a few years. 2. Title block completed on all schematic and other drawings. 3. Check pin numbers of all custom-generated parts. Especially check the rotation direction on footprints, considering surface mount and DIP can be confusing. Pinout may vary between DIP and various SMD packages. 4. Check power and ground pins of devices. Check supply voltages as well as supply types are used appropriately (battery, switched, ref_1V ). 5. Check hidden power and ground connections – or don’t use them. 1. Unused CMOS inputs should always be pulled up or down. Consider logic pins not connected directly to power or ground but use resistors for in-circuit testing and modifications. 2. Spare connector and IC pins accessible on prototype boards, just in case. Use resistors to tie them to ground so connection points are available. 3. CMOS gates always operated by logic levels at the rails to minimize current. 4. No outputs joined together except open collector (collector or drain ORed). 5. Inputs have current limiting resistors to protect against expected voltages. 6. Outputs have current limiting to protect against shorts and can supply expected currents. 7. Logic circuits not loaded inappropriately (to non logic levels). 8. Open collector outputs have on board pullups. Check that output pullup voltage is not restricted unexpectedly by internal clamp diodes to the power rail. 9. Minimize opamp loads, especially LM324 and LM358 outputs loaded lightly to prevent distortion as the device switches to higher current mode. (< 50 microamps, and provide DC load to common). 10. Ensure inputs of unused opamps are not left floating, and the amplifier is configured appropriately (so it cannot oscillate). 11. Check time delays and slew rates of opamps used as comparators. 12. Use current limiting resistors on opamp inputs always (1 mA). 13. Check common mode input voltage range on opamps. It is not always rail to rail. 14. Check failure modes and effects of failed power semiconductors. 15. Devices with quasi-bidirectional ports must not have pull down resistors attached – they can toggle the state. 16. Use hard pulldowns to get a low (< 1 K), or add stronger pullup resistor. Make sure inputs cannot be driven by hard voltage. 17. Consider grounding any crystals used on the board to proper ground to reduce EMI. 1. External connections filtered for RFI and expected voltages. Use ferrite beads for VHF, 100 ohms and 1nF for RS232 and appropriate values for other lines or sensor inputs. No capacitors on amplifier outputs unless isolated by appropriate series impedances. 2. External I/O lines have a defined state when unplugged (pullup or pull down). 3. Make sure I/O devices can handle unknown outputs (usually inputs with weak pullup to high) until the reset is over. 4. Consider making all external digital inputs active low. Outputs may be either polarity but consider startup. 5. Consider connectors where ground made first and breaks last for hot pluggability. Phono plugs are an example. 1. Check setup, hold, and access times for data and address bus. 2. Check capacitance and fan out limits for bus. 3. Check the data sheet and notes for unfamiliar ICs. Read the small print and also in between the lines. 4. Search for meta stable states such as a 2 gate latch which can be set and reset at the same time with an indeterminate result. Other causes are clocked circuits with runt clock pulses (too short or too low), or slow rise time clock pulses. The result may be loss of timing due to non logic levels, delayed state change or inappropriate states, causing system failure. ‘Slack’ timing available on clock pulses is an issue in reducing the adverse effects. changing close together and can generate a burst of glitches. Some will be ‘runt pulses’. These are best used in systems with a latch or gate to enable the output when the data has settled. 6. A reset circuit may be required to reset devices to an appropriate state at power up. 1. Power supply filtering adequate, so input does not approach regulator dropout at lowest supply and full load ripple. 2. Rectifier diodes always add reverse recovery spikes that pass through regulators. These usually end up as 10 mV noise pulses at line rate. Filter them with inductors, resistors and capacitors as required. Snubbers across diodes may help reduce radiation. 3. Use mains transformers with electrostatic shields for really low noise systems. Plugpacks will usually not suffice. 4. Power supply reservoir should be adequate, providing a holdup time at least 200 ms at full load and lowest supply. 5. Device supply decoupling adequate (especially CPU, memory devices). Consider adding series impedances for best decoupling. 7. Regulators have supply capacitors bigger than total load capacitance for protection against reverse bias. 8. Sufficient stabilizing capacitance on low dropout voltage regulator outputs. 9. Consider cascaded regulators can have high current states. Check them by slowly reducing the power below minimum system voltage (until the regulators drop out) while monitoring the current. if it has enough energy. The inductive device needs snubbers and reverse clamps directly across it, not just across the switch device. The power supply may need to be appropriately clamped. Consider cars have up to 100 V spikes normally! 11. Check operating voltage range of overall system (low battery condition). 12. Consider fuses carefully, keeping in mind they protect from fires, and protect the supply, not the load. 13. Check any devices that power down are isolated from devices that remain powered up. Use open collector or tristate interface devices with hardware operated control line as appropriate. 14. Estimate total worst case power supply current, and check that circuit operation agrees. 1. Voltage ratings and polarities of components checked. 2. Check polarized coupling capacitors cannot get reverse voltage. Eliminate polarized capacitors where possible. 3. Check if undervoltage and overvoltage protection is required. 4. Use over rated tantalum capacitors for longer life. 5. Amplifiers checked for stability. 6. Oscillators checked for reliable startup and within reset time of clocked systems like microprocessors. 7. Check heatsinking requirements for maximum power dissipation and worst-case operating temperatures. 8. Allow a wide safety margin for resistor power dissipation (< 1/3 rating). They can easily melt solder or char boards. 9. Keep reverse base-emitter current/voltage on bipolar transistors low (use diode clamps). 10. Check for voltage transients and high voltages on FET gates. Clamp gates of FET circuits to keep within ratings. Check that FETs biased at non digital levels have “gate stoppers” to limit high frequency response and prevent parasitic oscillation. 11. Protect collectors/drains from fast risetime pulses that may cause inductance in leads and loads to generate damaging high voltage spikes. 12. Consider signal rate-of-rise and fall for noise radiation. 13. Separate analog signals from noisy or digital signals. 14. Surge current magnitude through semiconductors within rating. 1. Reset circuit designs must be reliable, both glitch-free and consistent; tested with fast and slow power supply rise and fall time. The capacitor type is inferior – consider comparator types, but test them carefully for low voltage behavior. 2. Check reset behavior when power supply cycles before the circuit is fully operational. 3. Consider watchdog timer testing, disabling and diagnostics. 4. Monitor power supply operation during shutdown and startup and supply on-off cycling. 1. Copyright notice on PCB in copper. 2. Date code on PCB in copper. 3. PCB ID number and layer number on each layer in copper. 4. Drill legend – what sizes are used? 5. 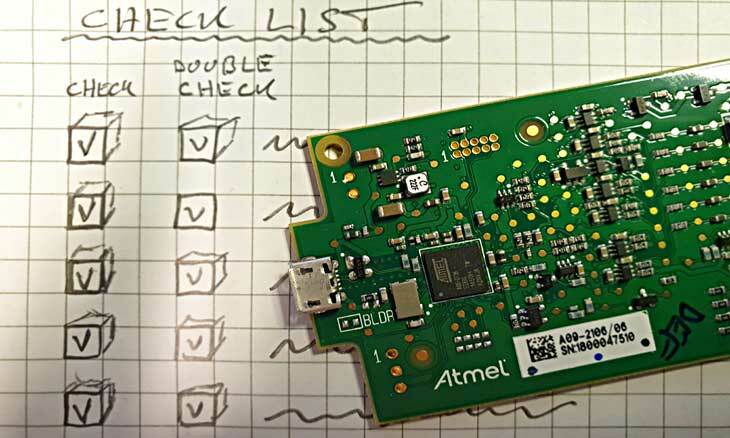 Netlist check – automatic and manual. Look for nets with single nodes or too many nodes. 6. Design rule check. A manual version can find problems missed by automatic checks. 7. Check for dead-end traces. 8. Ensure schematic software did / did not separate Vcc from Vdd, Vss from GND as needed. 1. When determining board size go for a larger board within reason. This decreases time to layout or auto route, populate, debug and maintain. Small size is cute but not always needed. 2. Consider PCB manufacturing panel sizes when deciding on PCB sizes. (Minimize wastage of PCB’s per panel). 3. Finished hole sizes are >=10 thou larger than the lead, or larger spec dictated by automatic insertion gear. Holes on layout are probably finished sizes, after plating. 4. Pads >=15 thou larger than finished hole sizes. 5. Place thru hole components on 50 thou grid. 6. All components >= 0.2″ from edge of PCB. 7. Silk screen legend text weight >=10 thou. 8. Check layout rules with your pcb manufacturer. 1. Are mounting holes electrically isolated or grounded? 2. Allow proper mounting hole clearance for hardware. Allow space around them for stand off mounts, washers, brackets. 3. All polarized components checked. 4. No acute inside angles in foil. 5. No traces within 20 thou of PCB edge. 6. Serial number blank on silk screen legend. 7. Thru hole drill tolerance noted. 8. Thru hole solder mask tolerance noted. 9. Thru hole route tolerance noted. 10. Thru hole silk screen legend tolerance noted. 11. Use ground planes where possible. 1. Mounting holes matched 1:1 with mating parts. 2. All polarized components point same way. 3. Use but ensure there is minimum component body spacing. 4. Clearance for IC extraction tools. 5. Clearance for IC sockets (especially for during proto phase). Sufficient clearance for socketed ICs. 6. Sockets used on devices prone to damage (near I/O connectors). 7. CPU devices usually socketed to allow bus testing, emulator etc. 8. Visual references for automated assembly (future auto placement). 9. Tooling holes for automated assembly (future auto placement). 10. Tooling and mounting holes have internal plane clearance to avoid multilayer shorts. (Expect the software to look after this, but check it). 11. Ensure pin 1 interpretation and orientation consistent among all connectors of a given type on the board. 12. All ICs have pin one marking visible when chip is installed. 13. Standoffs on power resistors or other hot components. 14. Check power and ground connections to all ICs. 15. Check hole diameters for odd components: rectangular pins, spring pins. 1. Trace width sufficient for current carried, consider trace heating especially on internal layers. 2. Thermal relief’s for internal power layers. 3. Clearance for high voltage traces. 4. Clearance and guards between noisy and quiet lines. Noisy ones to note are the capacitors on negative rail 7661 chips, RS232 lines, digital lines and busses. Keep noisy lines short. 5. Bypass capacitors located close to IC power pins. Minimize loop areas of decoupling capacitors. High frequency crystal cases should be flush to the PCB and grounded so they don’t become an antenna. 6. Check for traces running under noisy or sensitive components. 7. Use guard tracks round high impedance and low noise lines. Keep them short. 8. Component and trace keepout areas observed. 9. Digital and analog signal commons joined at only one point. 10. Place I/O devices near where their signals leave the board. 11. EMI and RFI filtering as close as possible to exit and entry points of shielded areas, I/O connectors. 12. Provide multiple vias for high current and/or low impedance traces. 13. Consider ground loops and voltage drops on tracks – ground ain’t ground. 1. Provide a ground test point, accessible and sized for scope ground clip. 2. Potentiometers should increase controlled quantity clockwise. 3. Check the orientation of all connectors using actual connector/cable. 4. Silkscreen text located to be readable when the board is populated. 5. No vias under metal-film resistors and similar poorly insulated parts. 6. Check for traces which may be susceptible to solder bridging. 1. Assembly notes for all special operations such as glue, inductors, clamps, brackets. 2. Conformal coating, and masking for it. 3. Special static handling precautions required during assembly and test. 5. Cable ties or lacing cord shown where needed. 7. Voltage drop at maximum current with specified wire for entire current path (eg. power and ground). 9. Control of flexing, vibration and shock. 2. Have a version number and change it every time the software is modified. Have a note at beginning of software explaining what has been done in this version. 4. Loops checked for exit conditions. 5. Communications and other ‘wait’ timeouts checked. 7. Check for event showers, where one event causes other events (e.g. a resize in a resize can cause a paint and a resize, which causes more, until the stack is blown. 8. Check for event lockouts (code running in a loop prevents events being detected). 9. Check for interrupt showers (where one event causes multiple interrupts. 10. Check stack size with maximum pushdown. 11. Avoid using the stack for variables if relevant, due to the confusion in popping and pushing. 12. Use defined variables (‘option explicit’ in basic). 13. Avoid re-entrant code – it is too hard to debug and understand. time the procedure is running only. They are temporary. each step of a procedure. than 25 lines of statements as ‘suspicious’. 19. Follow the concepts of structured programming, avoiding ‘spaghetti’ code that is difficult to understand. 20. Consider the differences between ‘for-next’, ‘while’, and ‘until’. 21. CPU utilization measured, especially in critical loops such as processing an ADC or signal processing where real time response is needed. 22. Interrupt response time measured. 23. Interrupt execution time measured. 24. Naming conventions consistent and meaningful. 25. Adherence to coding style standards – others or even you may have to debug it. 26. Build in debug aids for example a debug flag to allow test files to be run to emulate I/O. 28. Unused interrupt vectors trapped. 29. Unused ROM space loaded with trap or restart instructions. 30. Warm and cold reset differences. 31. ROM default, user setting, stored (non volatile) user settings considered. 32. Nonvolatile memory corruption possibilities checked during power-up, power-down, and program-gone-wild conditions. 33. Adequate comments and design notes in code. Explain I/O, steps being taken in global terms, not in terms of ‘load R8’. Have a software manual or topic in the technical manual if additional notes required. 34. Check for FIFO and buffer overruns. 35. Check critical timer driver code, timer event driven processes. 37. Use a standard reminder flag and check for any flagged statements in software. 1. Test points on PCBs for critical circuits, hard to reach nets. 2. Test pads on a regular grid for (future) in-circuit or bed-of-nails functional testing. 3. Test and calibration procedure written before production starts. 4. Special test arrangements and connectors for testing – provide schematic and describe in test procedure. 7. Self test mode – software has built in procedures such as analogue and digital I/O commands to aid in diagnostics. Event logging of exceptional conditions. 1. Thermal cycling excursions internal to components and assemblies within acceptable limits. 2. Capacitors mounted below or away from heat-dissipating devices such as transformers. 3. Consider test aids on board such as test signal source, switches, pushbuttons and status LEDs on PCB or elsewhere. 4. Provide test routines in software so commissioning is automated where possible. Examples are memory test, activity LED, watchdog test and disable, I/O tests. Others are battery backup, RTC, non-volatile memory, special test cycles. 5. Defaults for switches and settings that make the system work in some defined way. 6. Error messages to indicate what problems the software has found. 1. Remember electronic failures are due to bad environment. 2. EMC addressed, but in some cases special consideration required for emission or susceptibility – eg a data logger to work on the deck of a vessel must have RADAR protection. 6. Clear safety warnings in manual and wherever hazards exist. Control these hazards. 9. Room to remove fuse without damaging other components – warning to remove power. compliance, contact info, parts lists, warranty and so on. On developers workstations, use readily located directories for software, user manuals and other documentation. They should be project oriented. Use a paper file folder during project development phase. There is still some stuff that isn’t on a computer. project. Use html files designed so relevant parts (e.g. manuals, checklists) can be printed. solving, operational checklists, tips and procedures. Calibration sheet template in word processor format. Used to enter test results. Get others to test the device, especially the end user. resources (battery and memory reserves). it on, or at least explain what to do next. Ask users if they are satisfied.